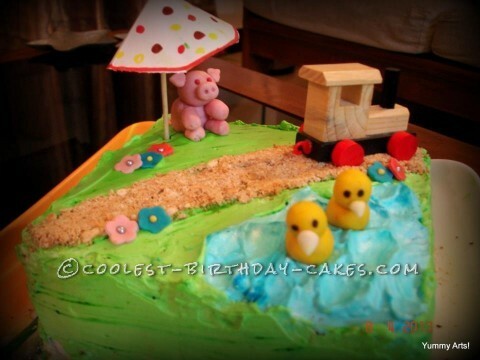 It had always been on my mind to do a farm themed birthday cake. And what better occasion than a kids’ party! I prepared the fondant figures before hand i.e the piglet and the ducklings. The duckling were a request from my kids and the piglet came as a request from one of their friends. It had been quite an enjoyable task doing the fondant figures. The cake was an eggless chocolate one with whipped cream frosting and filling. My elder daughter did a drawing showing me which object she wanted where. I also wanted to do a pig house but the cake, which was just a kg, was too small to do all those stuff. I instead made a cocktail umbrella and fixed it next to the little piggy. I also placed a small tractor kind of toy vehicle which I had at home (part of kids’ stuff) on the road which was created using biscuit crumbs. The kids loved and relished the cake. My kids now insist upon doing another farm themed cake with a lot of other farm animals.